One of the earliest Norse gods to be worshipped, Tyr was also known as Tir, Tiwaz, and Tiv. His name literally means “god”, and has the same linguistic root as Zeus, the chief god of the Greek pantheon. Tyr was the god of war and justice, and may have started out as the chief god of the pantheon before Odin came to be seen as the leader. He was the patron god of justice and the formality of war, and resided over the making of fair treaties. He gave his name to Tuesday in English, German, and most other northern-European languages. The Romans identified him with their god Mars, also a god of war. He was closely associated with Odin and, like Odin, he received sacrifices of hanged men. Seen as the bravest of the gods, he had a reputation for being wise, fair, and always a man of his word. While Odin was cunning and Thor was physically stronger, Tyr was the god of courage and honor. He was famed for his bravery and might, and was a popular warrior and sword god, often invoked before a battle or a fight. His rune or name was engraved on blades and spears, and he was honored with sword dances. The Vikings customarily cast a spear over the head of an enemy as a sacrifice before fighting began in earnest, and several ornate, decorated spears dedicated to Tyr have been found,suggesting that he was invoked on occasions like this. 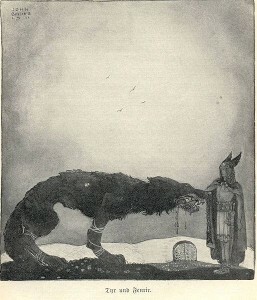 Not many stories involving Tyr survive, but he was involved in the binding of the wolf Fenrir, the offspring of the god Loki and the giantess Angrboda. The beast could not be restrained by any normal chain; the gods tried twice to bind him, pretending that it was a game, but each time, Fenrir snapped the chains easily. The gods turned to the dwarves for help, who made Gleipnir, an unbreakable magic chain. However,Fenrir became suspicious and refused to be bound again. In order to persuade him, Tyr placed his right hand in Fenrir’s mouth as a sign of goodwill, and the wolf agreed to let the others bind him with Gleipnir. When the magic chain was placed around him and Fenrir discovered that it could not be broken,he bit off Tyr’s hand in rage. Tyr was in agony, but the other gods rejoiced at finally having bound Fenrir. Afterwards, the wolf was chained to a boulder, and his constant howling was silenced when the gods thrust a sword into his mouth. Meanwhile Tyr, lacking his right hand, was still just as skilled a warrior with his left. He was destined to fight in Ragnarok along with the others, where he would slay the hound Garm, who had always stood at the gates of Hel and acted as a watchdog for the land of the dead. Afterwards, Tyr would die of his wounds, so like most pre-destined duels at Ragnarok,this one resulted in the two fighters killing each other. Copyright © 2012-2014 Melissa Snark. All rights reserved.